A cold low pressure area is just off our coast and is moving eastward. This system will move across the area today with showers and thunderstorms. Because the airmass is so cold hail will associated with some of the thunderstorms. Snow levels will be 2000 to 2500 feet. One of the critical weather issues with this low is how fast it gets east of our area and how fast the skies clear tonight. This system will bring in very cold air tonight and with clear skies and light winds the temperatures will drop. Some low lying wind sheltered areas in the valley may be near freezing tonight. Better cover those tomato plants just to be safe. Tuesday we have partly to mostly sunny skies with below normal temperatures. 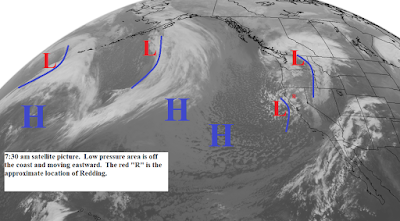 Wednesday a weak low pressure area will move across Northern California . This system will bring light showers to the foothills and mountains with a few sprinkles in the valley. Snow levels will be near 5000 feet. Thursday high pressure begins to build along the coast and will hold there through the weekend. Skies will be mostly clear and temperatures will be above normal by Friday.